How wonderful! What a way to celebrate love! How fun- that's quite a group! Best wishes to you for a Happy Valentine's Day! Sniff. Sniff. I would have loved to have joined y'all. Good morning, what a fun get together. Great post. Happy Valentine's Day! Happy Sunday, enjoy your new week! It is very special indeed to meet our beloved pen pals from afar. I've had that opportunity here in Minnesota and in California. THEN, I've had a few encounters on Skype with those in The Netherlands, Italy and England! What a memorable time for you dear one. ENJOY! How fun! Every time I read one of these posts or see a Texas hop, I am absolutely pea green! ;) You ladies really are lucky to live so close to one another and socialize in real life. Thanks for sharing the details of your day! A beautiful group of ladies! So glad you had such a great time and so sorry I missed it. Thanks for sharing the photos! I'm was so glad to be a part of the group. It was so nice to meet the other Texas Bloggers. Such a fun day and I can't wait until the next get together! Looks like great fun and the smiles are wonderful! I've met bloggers while visiting in Budapest, Hungary and Belfast, Ireland. It is great to develop friendships with others who share your interests! Looks like you young ladies had a wonderful time. How great to meet your fellow bloggers. I have met some terrific women through blogging and I treasure them dearly. Hope you and your honey are enjoying your Valentine's Day. I see you all had a wonderful time!! Its nice to put away the paint brushes and enjoy our friends. Just stopped by to say Happy Valentine's Day! 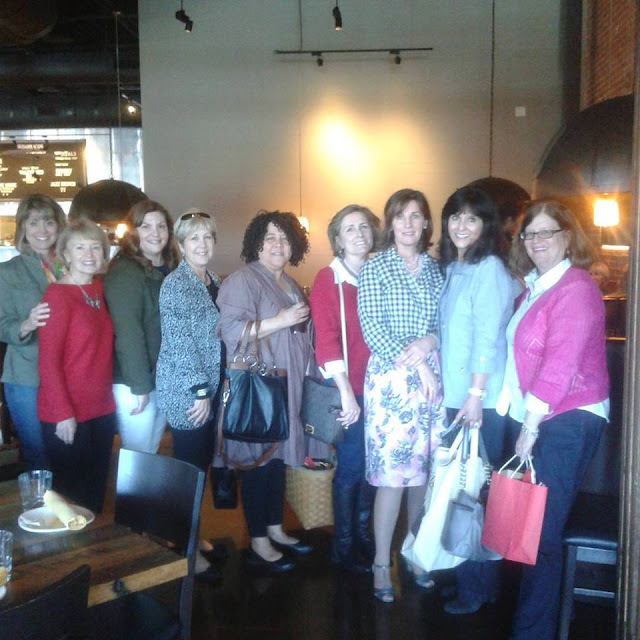 Thank you for sharing the photos from the Texas blogging friends lunching together on Feb. 11. I was sad that I was not able to join everyone, and am looking forward to the next gathering. This was such a special day. Thank you for sharing the photos. I'm so glad I got to meet you in person. You are gorgeous by the way!! That is so much fun! Yes, I have met a few MN bloggers :) I think we need a get together. Celeste a memorable memory and such fun. Meeting and greeting in person doesn't get any better. Looks like it was a lot of fun. What a fun, special time! It is one of my dreams to get to meet some of my blog friends! What a fun and special day you all had. I have met five of my blogging friends...a few of us have gotten together and gone antiquing. That is just great that so many of you have been able to get together, great idea for everyone to bring a little something to remember the day by, glad you had a good day out! Thank you for recapping our fun day, Celeste! What a great group of Texas bloggers we met and had such a fun party with. Hi Celestina, What a nice event and great idea to get local bloggers together!!!! I hope you had a Happy Valentines Day! What a lovely day to share friendship. Looking at you beautiful smiles I haven't any doubt that all of you had fun. A wonderful thing to stay in contact with blogger friends, if possible, you had such a lovely day I can tell. Lovely week to you dear Celeste . Good Afternoon Celestina Marie, How wonderful to meet with so many friends. I do recognise a few of the ladies, Kitty, Stacey, Laura and of course yourself. You all look lovely and so very happy. How fun to meet so many fellow Texas bloggers for lunch! What a nice group of ladies! Your table looks so pretty with all of the wonderful gifts. So glad you had a great time, Celestina! Wow Celestina, how lucky your were to have such a fun blogging get together with all of those bloggers! That sounds like it was so much fun. I hope you have a wonderful week. That looks like a wonderful get together! How many years have yall been meeting? How fun for all of you! So nice that you are able to do that, Celestina! Great post Celestina! It was so great to meet you even though we didn't get a chance to chat very much. Next time we'll be sure and sit together. ;-) It was so fun wasn't it? And i love making and receiving all the crafty goodies. What a fun looking group. That is so nice to get to meet in person. The table looks lovely. Great memories. I am STILL smiling from the warm memories made! What fun getting together with all your lovely blog friends and share a good time around the meal table. I'm already looking forward to our next activity! It looks like you ladies had so much fun!! I'll have to visit all of these blogs since there are a few I'm missing! Thanks for sharing this great post with us Celestina! I am a little late to the post but this is so cool. How fun to hook up with like minded women! Hope you had a great V-Day. Have a wonderful weekend!! Forgive me for just now writing a comment on this delightful post. Thank you so much for sharing your lovely time with us. There is such joy in your smiles. Hugs to you!